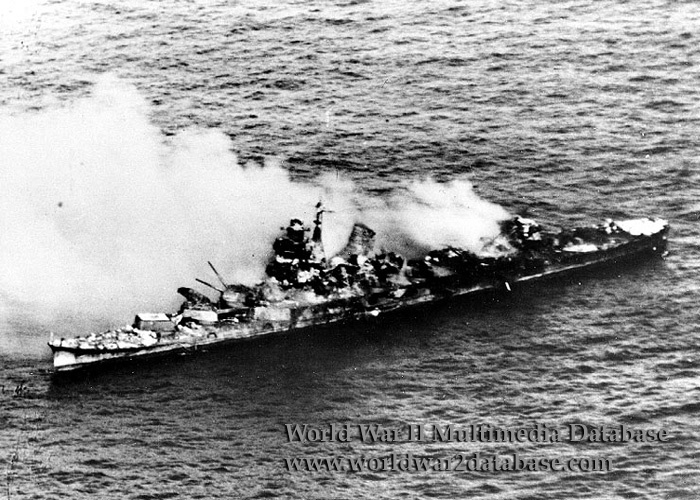 The burning Japanese heavy cruiser IJN Mikuma, photographed from a VB-6 SBD from USS Enterprise (CV-6) around 1445 Hours on June 4, 1942, after she had been bombed by Douglas SBD-3 Dauntlesses from Enterprise and USS Hornet (CV-8). Note her third eight-inch gun turret, with roof blown off and barrels at different elevations, Japanese Sun insignia painted atop the forward turret and wrecked midships superstructure. The white mark at the waterline forward of the aft turret number four is a torpedo hanging in the water. Five bombs hit Mikuma. One hit the forecastle, incapacitating the forward turrets, exploding ready ammunition and killing or maiming much of the bridge crew; the smokestack was hit, disabling the propulsion and killing many engineers; a hit behind the smokestack exploded the launcher for type 93 torpedoes, causing heavy damage. A fire erupted immediately, preventing many from escaping. 650 Japanese are killed and 240 survive.